I haven't used VesselMover, but I don't see why it would not work with the pads. They are parts after all, and act like other parts. 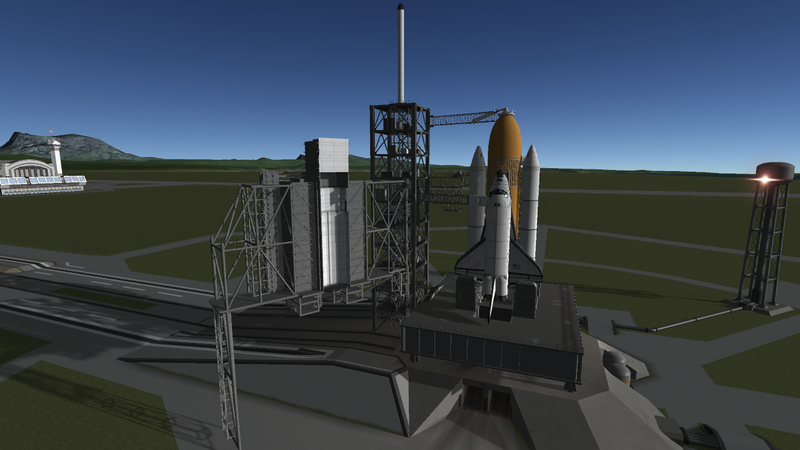 Beyond the hinge and mount, there isn't much to the RSS other than an early version of the payload changeout room opening, and some placeholder objects for the outer support, put in temporarily for planning purposes. A design decision I've made was to have the outer support rest on the ground when the RSS is in the rolled-back position; this makes the support clip through the pad and be partially hidden when closed. 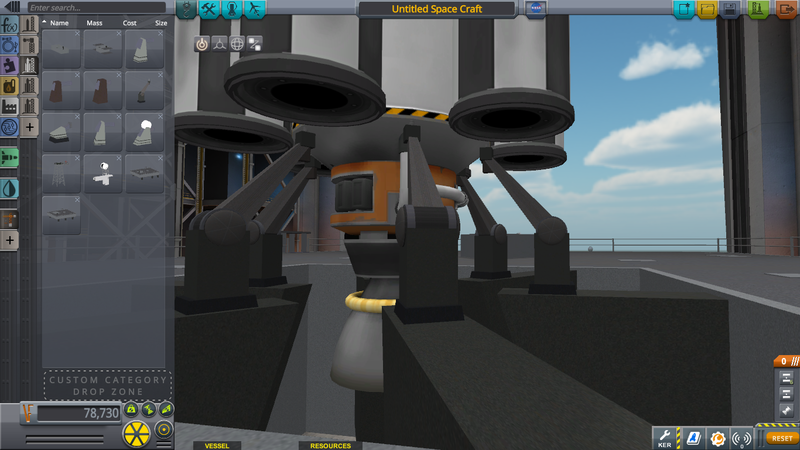 Since I don't want the RSS to be suspended in mid-air, and the open position is the one most used, I went with clipping through the pad. 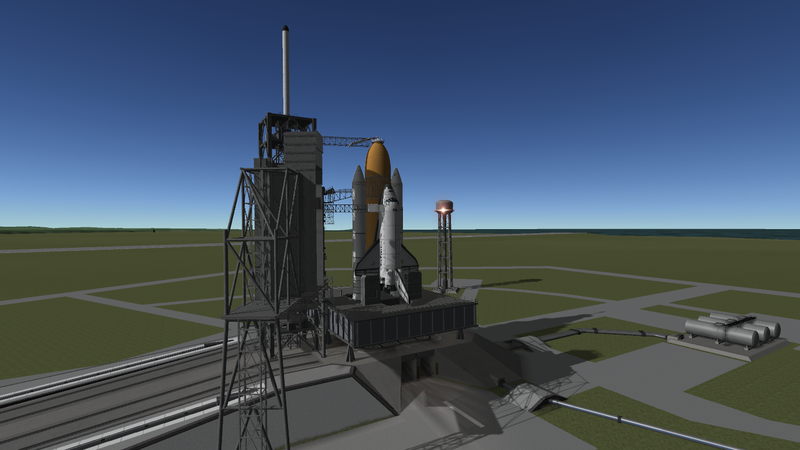 The RSS is extremely complex, and no way will I include every detail or try for near faithfulness to the real one. Another option you could consider for the RSS supports is to have a track that the RSS runs on. 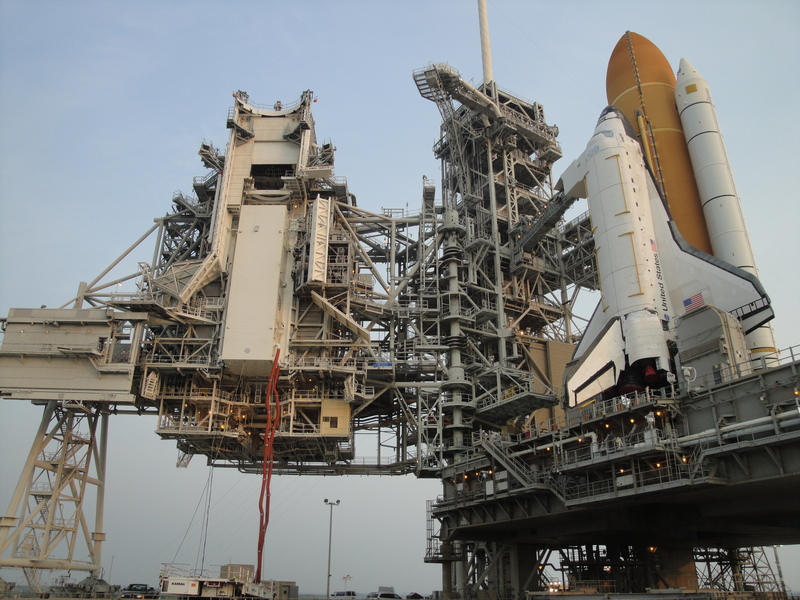 The supports for the track would clip into the launch pad, which won't matter much, and the RSS supports would ride on wheels which would run on the track, eliminating the need for moving objects to clip through the pad. i'm not sure how much more work that would be to implement, but it's just my $0.02. Yep, that would be more work, and then you'd have an elevated track...not what I want either. One question at the moment: can you make 6xSymetry for Base Insert Square to fit rockets like this? Funny enough, when I added the 3x120 configuration, I had also thought about a 6x60 version...but decided not to, as I felt that the 3-way version was sufficient for the Delta II and other rockets with multiple small SRBs or side boosters, using the new bottom-mount hold-down arm (which was inspired by the Delta II's and Titan II's hold-downs). However, I see I was in error, and can rather easily make a 6-way version. I'll have it up on Wednesday, as part of yet another MLP v1.3 update. Will use the existing v1.3 square insert. Incidentally, that's the Saturn V tail service mast you're using, and was not actually a hold-down or clamp. I have the new insert ready for separate download from my Dropbox if you don't want to wait for the official update release. Put the .cfg file into ModularLaunchPads/Saturn_Pad/Base_Parts; overwrite the old one. Also can we get holding arm with longer ..arm. Please? Whoops! Thanks, I keep forgettting to change things in the dev folder files before zipping them up. Got it fixed. It was designed for rockets like this, and indeed many rockets use something like it. I changed its part title to say "Bottom-Mount" instead of "General" to reflect this. There already is a long-arm hold down type; an even longer one would require a whole new part. It'll be something I can add in for v2.0, probably a mesh-switching one with different arm length options. New version 1.3.6 with the revised square insert is now up on Spacedock! The pads have a sound emitting on staging, right? Nevermind, just another weirdness in my borked-again game. The only sound is the staging/decoupling sound. 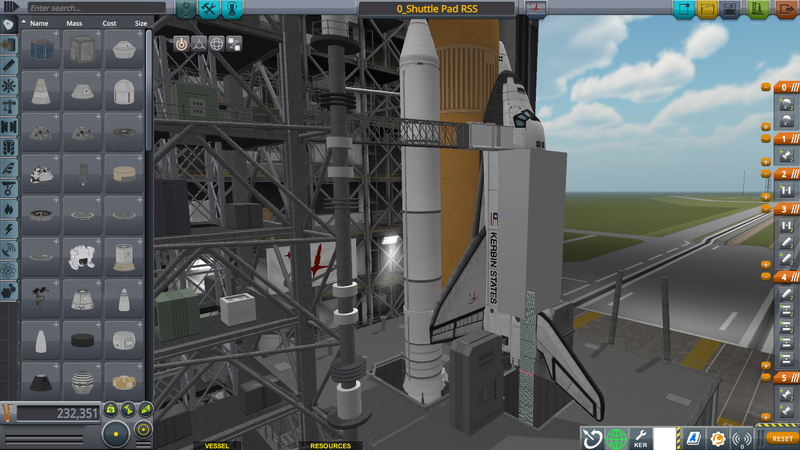 Progress on the shuttle pad RSS: Started to fill in details and put in parts for the framework...it now has a connection to the hinge! 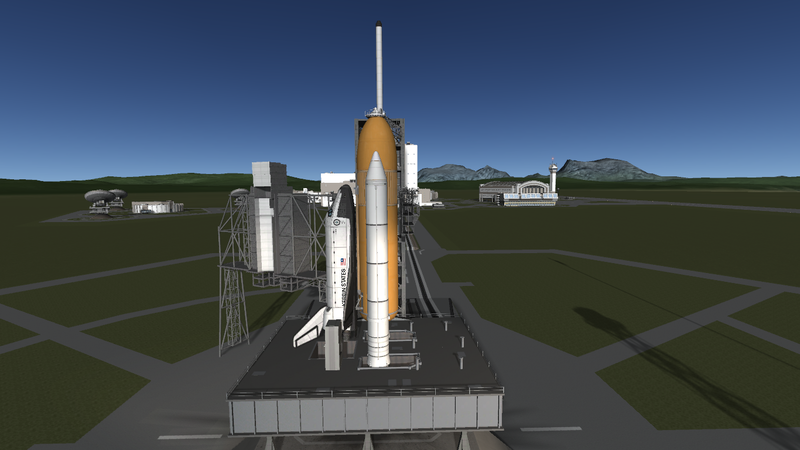 New stuff isn't textured yet...or even using a KSP shader....that will come later. 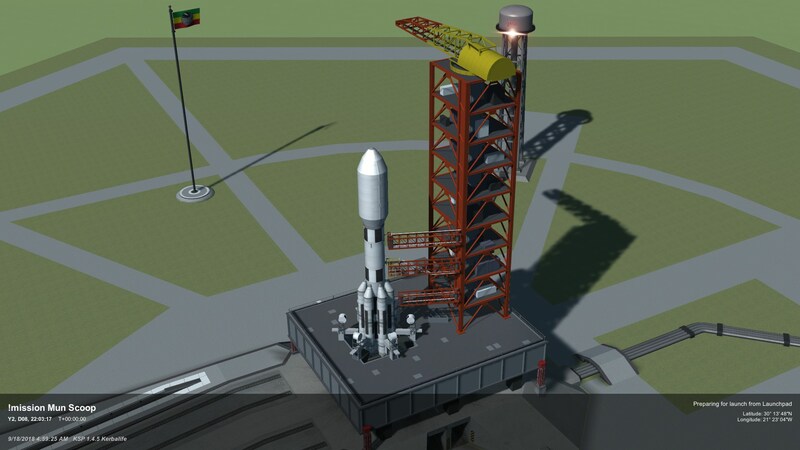 In v2.0, there will be a Delta II tower add-on (among others) for the new general-type pad bases, and it will work with the Saturn mobile launhcer base as well. 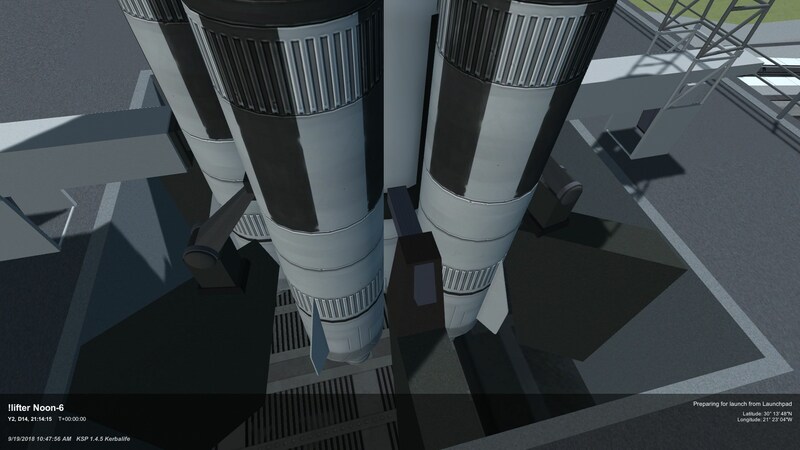 It will be able to use new modular drop-umbilicals as well as swing arms, not just the Saturn V ones but new smaller ones as well. 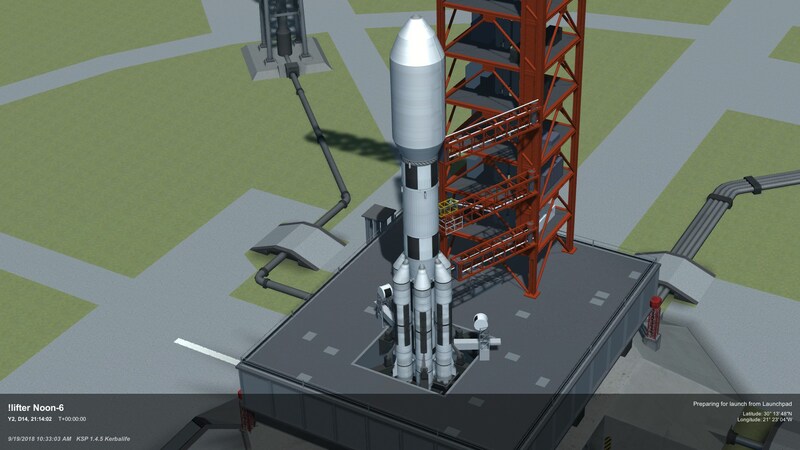 I'm still deciding whether to make the new towers in modular pieces like the new Saturn tower (switchable-height section with separate base and top sections), or just have a single-unit tower with adjustable heights (one of which will be the default one for the particular rocket it was meant for). 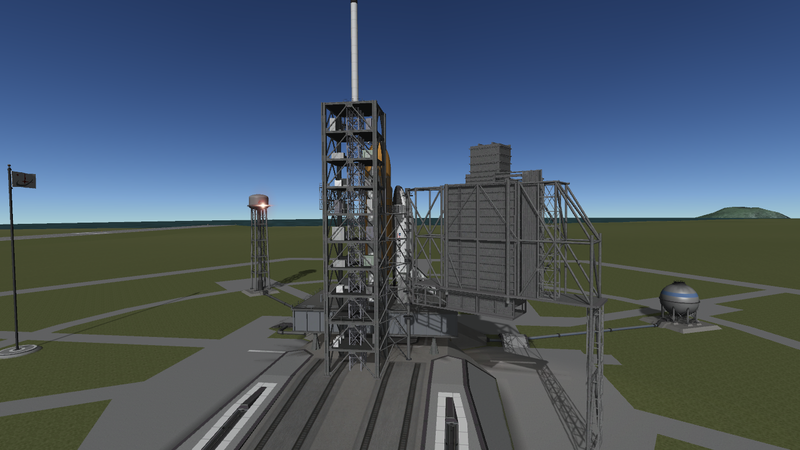 The Falcon 9 strongback will have to be like this, otherwise Animated Attachment would have to be used for the fallback animation, and I don't want to make that a requirement. More progress on the RSS...it's starting to fill in! The square an I-beams are still untextured, as some of them will be used to make other parts. 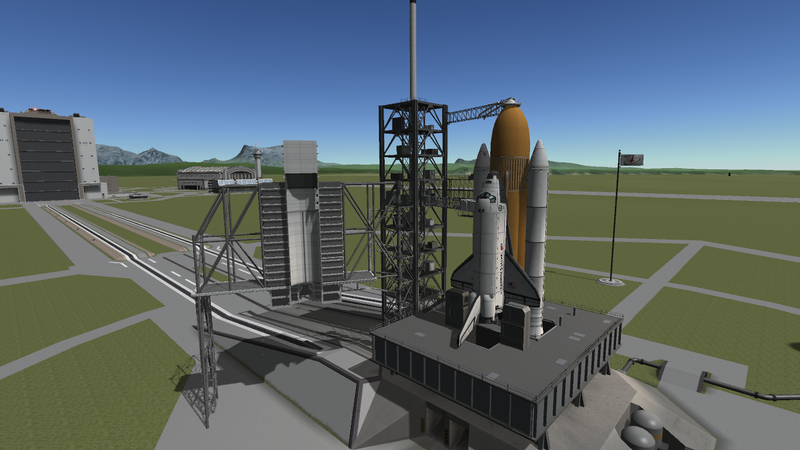 And a new dev build of the v2.0 Saturn and Shuttle pad parts is now on my Dropbox. Includes craft files for the CA shuttle, BDB Saturn V and BDB Saturn IB. 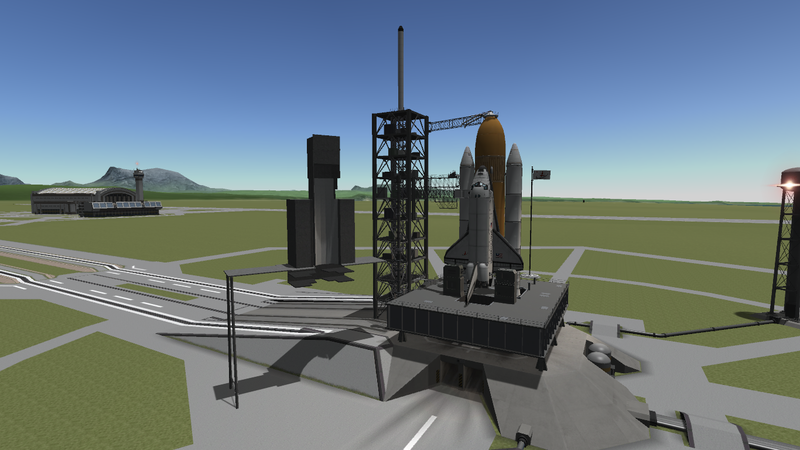 New dev build of the v2 Saturn and Shuttle pad parts, now with the new sparker FX, available on my Dropbox. Don't put the AlphaDev folder in the .zip into the ModularLaunchPads folder, as it is a standalone build and goes into Gamedata. Do you have plans for the sound suppression system? I put in the rainbirds and the pipes around the SRB holes, but they are just for looks and don't work...unless someone makes a water-spray effect. Do you mean the pipes and gantries that wrap around the MLP like in this picture? 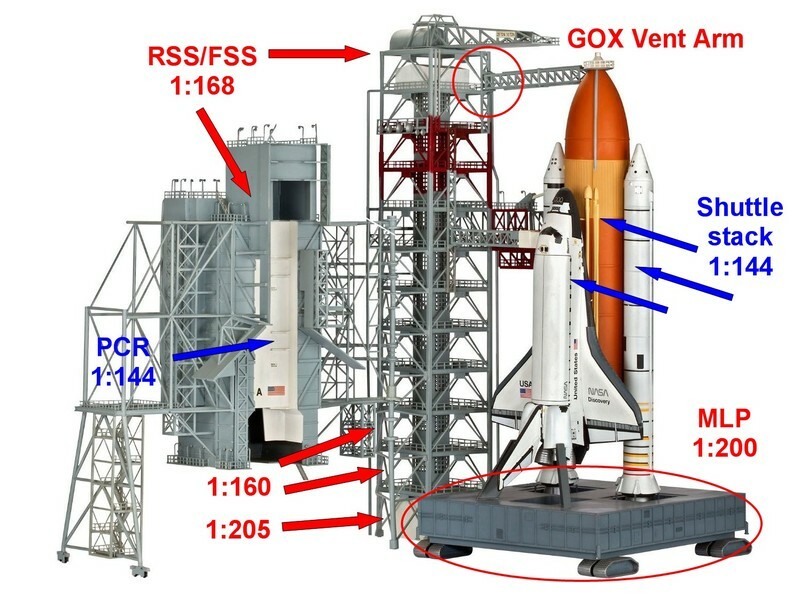 I'm not really sure what their purpose is or why they were added to the shuttle MLPs and not Apollo (mostly because I've never been able to find any good sources about the MLPs and launch infrastructure in general), but I really think they help make a launch pad look distinctly shuttle-era.